When I was a little girl my dad taught me how to be handy. He was always tinkering with something, or fixing something else, or building an addition to our home or installing a new engine in a car. There were times when I hated standing there handing him 2×4’s or nails, or getting my hands dirty inside a car engine. There were many times I wished I were inside in the air conditioning playing with my dolls, or as I grew older, talking on the phone. But as much as I complained while I was working along side him, I always felt a huge sense of pride and accomplishment once the project was complete. Not only did these jobs build my self-esteem and give me something to be proud of, they also actually taught me how to be the Handy person I am today. I’m sure there were many times when my dad figured it would just be easier to do it himself. But he didn’t just do it himself. He made his daughters stand there and get our hands dirty. And we wouldn’t just watch. He’d shove a hammer or a screw driver at us and make us use it. He’d push us onto the roof and give us a nail gun. And now, when our toilet breaks, or the bathroom needs to be re-tiled, I KNOW I can do it myself. I’m confident that I can fix pretty much anything, even if I have no clue where to start. And if I don’t know exactly how to do it, I’ll read about it, and then I’ll tackle it. Because my dad instilled a confidence in me in regards to being handy and tackling DIY projects. My goal in life is to instill this confidence in my children. I try whenever I can to find ways that they can help on projects. 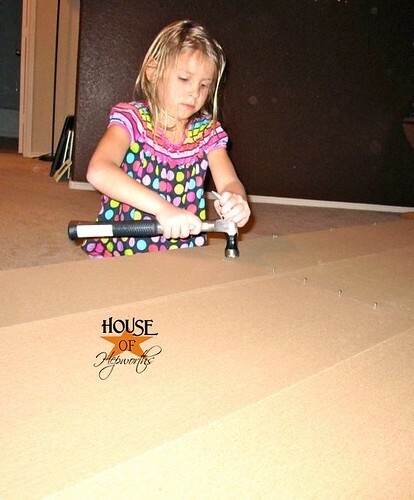 It may seem hard to come up with ways a 6 year old can help tackle home renovation and DIY projects, but if you think outside the box a little, there are many things you can do to help enlist your little ones. Once the shelf was almost finished, the way that I really let her “help” was to attach the back board. Here she is hammering the nails into the back of the shelf. Obviously a 6 year old can’t easily hold those tiny nails while hammering them in. She would totally have hammered her thumb! I went around and started each nail for her. Once they were all set, I gave her the hammer and let her go to town. She really enjoyed hammering in all the nails. It was such a simple thing to do, and she really loved it. 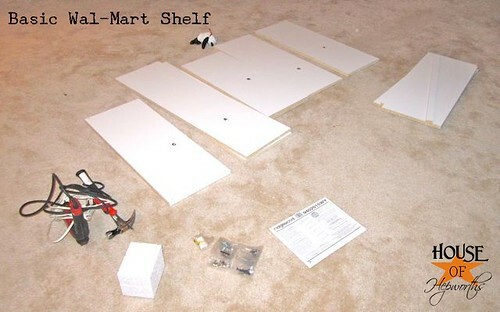 She felt like she played a part in putting together her shelf for her room. I could have easily just shoved her aside and hammered them all really quickly, but I spent an extra 10 minutes and let her help. 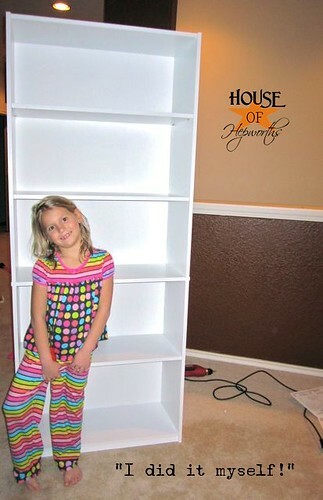 Not only did this project really build her self-esteem and gave her a sense of pride, it also taught her how to use a hammer. Now she’s one step closer to being her own handy little person. When the back was on, I leaned the shelf up and gave her all the little pins that hold each shelf on. She stuck them all in herself (except the ones she couldn’t reach) and then I let her put all the shelves in place. You can just see her beaming. She is obviously so proud of herself. 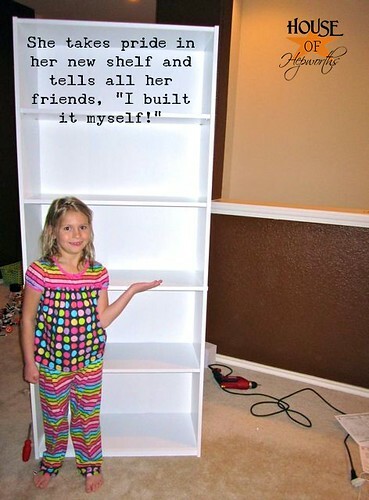 She’s been telling all her friends that come over to play that she built her own shelf by herself. It really doesn’t seem like much, but there are so many opportunities during your projects that you can do to incorporate your children and get them involved in helping. And even if they whine and complain like I did as a child, keep pushing them. They will thank you one day. And here is a quick little video of Kinsey putting her shelf together. I know I’m biased, but she is just so stinkin’ adorable. What ways do you let your kids help? I’d love to hear your ideas so I can learn more ways to let my kids help! YOU are a smart mommy!…..smiles. Right on! This is so, so true. You’re not only instilling confidence in your kids, but bit by bit you’re giving them valuable moments of independence and self-sufficience, which SO MANY kids are lacking these days by the time they reach adulthood. What a great post. Your memories of your childhood very closely reflect mine – from replacing engine belts and transmissions in cars to building a deck with my dad, to doing crafts and using creativity to build a cheaper knockoff of whatever we wanted with my mom, my parents really instilled in me a great sense of pride and a serious DIY attitude. I LOVE it, and have them to thank for it! It’s like we were separated at birth. My Dad is very handy and with my crafty Mom’s help renovated the mother of all fixer upper houses. I feel fortunate that my Dad never chased me away when he was working on a project and even let me “help” build a step stool from scrap wood when I was a toddler so I could reach the bathroom sink and brush my teeth. I credit being a good teacher and presenter and all around handy gal because of how my Dad taught me by example. They are also able to make their own meals and help set up everything for all the church fellowship and parties we have! They are able to do quite a bit for a 7 and 11 year old! What a wonderful post! 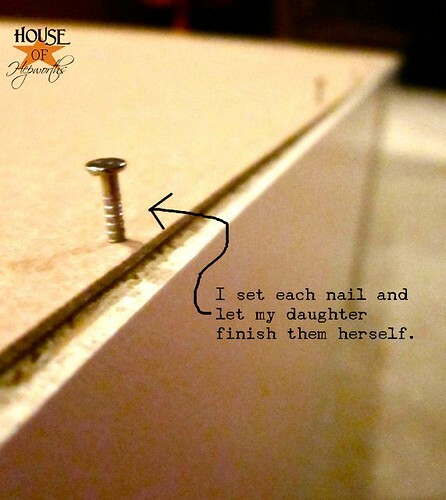 I would never have thought to get the nails started and have the kids finish it. Brilliant! I am teaching my boys how to sew right now. I am finding it easier to share my sewing room with them than my garage. You have given me the courage to include them with my projects. I will have to keep reminding myself that it will take longer and require more work, but it will be worth it! Thank you! I love this post. 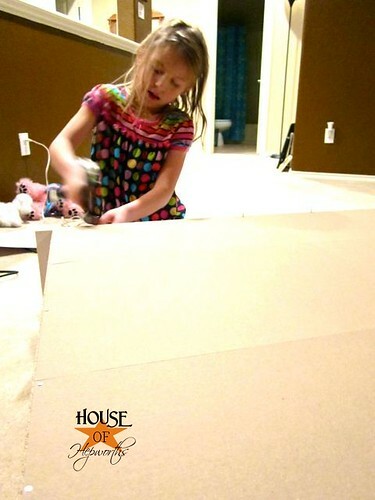 Agreed, we must instill confidence where we can…I don’t have a lot of confidence in myself when it comes to projects like this, so way to teach your little one! Thank you so much for this! I am ashamed to say that I am soooooo guilty of brushing my kids off when they’re begging and pleading me to help for the sake of getting things done quicker! I read this segment today and promptly told my son (4) to go get his toolbox that he got for his birthday and told my daughter (2 1/2) to go get a flashlight. We opened my son’s toolbox, and I had him choose the screwdriver that looked like it would fit, and he tightened up all the loose knobs in the house while my daughter held the flashlight for him! It was so much fun and so simple an idea! Thank you so much for helping me realize how important it is to include my kids in the would-be grown-up projects around the house! Now, time for me to get creative, get organized, and change my ways! Good for you! Yes we do have our children do their own projects. My husband is a professional handyman so he always has our boys help with projects, even the professional projects. It’s getting to the point where nothing is built in America anymore. It’s up to us to get our children to build with their hands. It’s so satisfying to be able to say ” I made that”. Just like you illustrated. thankful to come across the advice from this post.